A few weeks ago, I got these puff pastry sheets. I wasn’t sure what to do with them at the time, but I figured I could whip up something tasty with them. There wasn’t anything interesting on TV today, and I was starting to get bored… and when I get bored, I bake! I’m not sure how the weather was in your area, but here in south Jersey, it was fa-ree-zing, with a bitter cold wind… so this baker was not leaving the house to go buy ingredients. If I was going to bake, I’d have to raid my pantry. I remembered that earlier this morning, I came across a recipe for Chocolate Peanut Butter Whoopie Pies that I had pinned on my “Recipes I Must Try” board. I didn’t have the ingredients for the cookie part, but I had everything to make the peanut butter filling. But hmmm, what could I pair it with? I had Nutella leftover from my Nutella Crunch Cake Pops I made last week… ooh! And I had bananas too. Truth be told, they were hubby’s bananas for his Cheerios, but he could spare one. But how could I tie them all together? Then it hit me… the puff pastry sheets! 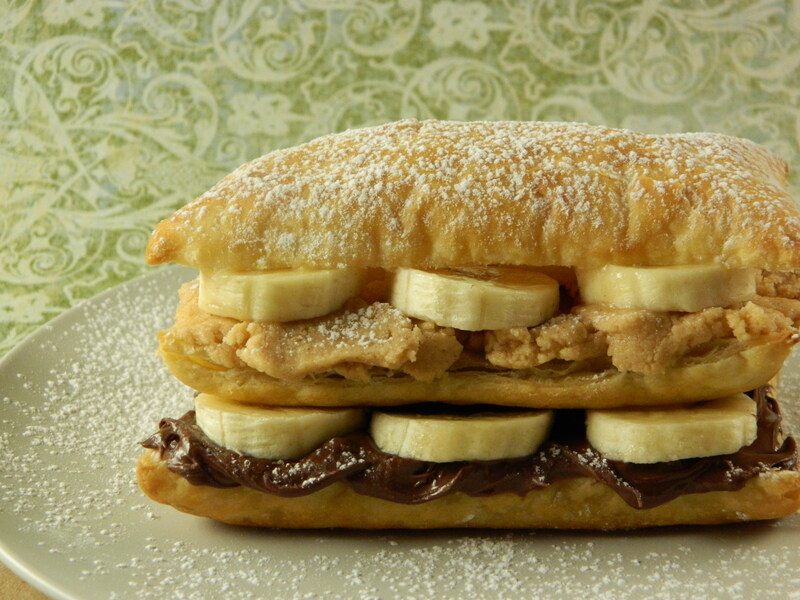 Ladies & gentlemen, I give you Nutella, Peanut Butter & Banana Napoleons! – Peanut butter filling (1/2 cup peanut butter, 3 tablespoons butter, 2 cups powdered sugar, 3 tablespoons milk. Beat peanut butter and butter together then add powdered sugar and milk and mix until well blended (it was a little thick when I made it). Source). Now, there’s a midnight snack!